The concept of plastic surgery (specifically, face alterations), has been taboo and a controversial subject for many. In certain places such as South Korea, it is widely accepted. This might not be true for other countries based on religious grounds and social consensus. As such, we would like to open the debate grounds for everyone: Why should plastic surgery be widely accepted? Before I start, this is not a biased opinion as I have not undergone plastic surgery, but I can vouch for those who did. The common notion against it is that plastic surgery destroys the spirit of being natural. It is invasive and it literally edits your facial structure and potentially cause one to look different. The stigma attached to this is that the patient who undergoes plastic surgery was not proud of his/her looks and had to do something about it so they can be better accepted by others. Are we not forgetting something? Why then, is makeup perfectly okay for everyone to use? 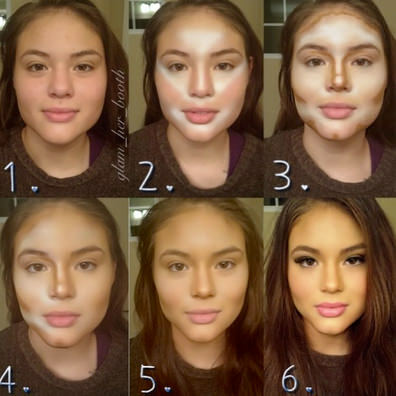 Is makeup not changing the features and natural look of your face into something artificial, too? Millions of women walk out everyday with makeup on. For males, millions of them walk out everyday with hair gel on. Are these people showing off their natural looks, untouched looks? I didn’t think so. Most of us do not have the confidence or will to show the whole world our bare naked faces and scruffy hair-do. We use all sorts of chemicals and products to change the way our faces and hair look so we can give other people a better impression. Both methods change the face, both methods are fake, and both methods hide the original, ‘natural’ look. The difference is that one is temporary and the other is permanent. However, in our case, we wear makeup nearly all the time whenever we step out of the house to meet our friends or report to work. The effect of makeup is virtually permanent if we choose to apply it everyday. So why then, is makeup more justifiable than plastic surgery? Another key point to note is that aesthetic surgery (which involves treating aesthetic features of the body) has already been around and accepted for a long time. Braces are a good example. We accept it when people put on braces to straighten out their teeth for a perfect smile. We condemn it when people undergo surgery to sharpen their noses or jawline. Why are particular body parts more “right” than other body parts? Why is it okay to edit one’s teeth but not okay to edit one’s nose? Let’s not forget the other acceptable body parts which includes belly fat (liposuction), arms and thighs (skin tightening), hair (re-growth therapy or brazilian wax). There are also various forms of aesthetic surgery, such as prosthetic limbs, to give disabled people the chance to feel like a normal human again. Aesthetic surgery is not all that bad. It gives people a second chance to become what we want to be, as long as they are willing to go through the risks and costs to do so. Because if the public were to denounce plastic surgery on the grounds that the patient is not proud of his natural looks, then we all are guilty of it. We aren’t proud of our crooked teeth, our hairs in the armpits or nether regions, the fat around our belly, legs and arms, the pimples, blemishes and freckles on our skin, the natural waves of our hair. And all of us are guilty of using means and ways to change these ‘natural’ looks into artificial, better-looking ones. And yet we condemn plastic surgery. Well….. after make-up, there is no hiding the truth. With plastic surgeries and burning of old pics, only your biological kid will tell the truth of what you originally look like.